Click on REGISTER on the top right hand side of the page or click here to sign up with us. Fill out all the required fields and wait a minute for a confirmation email with further instructions. Why do I have to give so much personal information? All the information we collect is a legal requirement of the Western Cape Gaming and Racing Board and is for your own safety. Does it cost anything to register an account? No. We only allow one account per person. Can I place bets through my wife’s / friend’s / brother’s account? No, please register and only use your own account if you’re the one who will be betting. Otherwise, there will be issues when it comes to withdrawals. Do you have a betting shop I can visit? No. We don’t have any physical shops. I’ve forgotten my password or username. Send your username & email address to info@eazibet.co.za and we will reset your password. In this instance, we will send a temporary password to you via SMS. Why can’t I log in with my username and password? If you enter the wrong username or password, you won't be able to log in and after 3 failed attempts, the account will automatically be locked and you will need to contact our support for assistance. Either via email info@eazibet.co.za or via WhatsApp: 078 1751 327. If you haven’t been FICA verified then you won’t be able to log in until you send us proof of yur ID & address or if you are guilty of breach of any of our T&C's, you will be blocked from our website. The deposit options are EFT, cash deposits, 1voucher, OTT Voucher, Online Banking & Instant EFT's, Credit Card, Debit Card and Cheque Card. Login to your account and go to the deposit page and choose your method of choice. One way to make a cash payment into your EaziBet account is at an actual bank or through any new ATM’s that accept cash deposits, normally found at main bank branch offices and large shopping malls. You can find our banking details above. Your other cash option is to buy a voucher, either a 1voucher from any FLASH outlet near you or you can buy an OTT Voucher. FLASH and Pep both offer the 1voucher. From any FLASH mobile device, select Money Transfer, put in the amount and click print for the voucher code. Enter that code on our deposit page and your account will be topped up. You can do the same thing to redeem your OTT voucher and you can buy these vouchers from all any Boxer store, any Kazang or Glocell store and also from your nearest Shoprite. You can redeem the voucher on the deposit page by punching in the voucher code. Find your closest store HERE. Make sure you are selecting the right voucher type on our deposit page, either 1voucher or OTT voucher, before punching in the voucher code on our deposit page. Deposits are credited to accounts within different time frames and are dependent on the deposit method. Credit card transactions are done instantly once authorization takes place whereas bank transfers (EFT) can take up to 5 days. If you deposit via EFT you need to notify us by sending an email or payment notification to info@eazibet.co.za as the payment needs to be approved before reflecting in your betting account. I made a deposit into my account and the funds are not reflecting? If funds do not reflect in your account, please take banking time delays into consideration. If your credit card or instant EFT deposit does not reflect, please email support at info@eazibet.co.za. Can I deposit with my phone? Yes if you’re using your phone to access your internet banking. Can I use a credit card that is not in my name? By no means can we accept credit cards that are not in your name even if you have been given permission by someone else. How do I deposit if I don’t have internet banking? You can easily make an EFT transaction at your bank branch with the help of the teller. You can make a cash deposit via specific ATMs that accept cash deposits, normally at main bank branch offices. You can also buy a 1voucher or an OTT Voucher and enter the code in our deposits page when you are logged into your EaziBet account. You can find our banking details above. Electronic Funds Transfer. It’s simply transferring money from your bank account to someone else’s bank account. What do I use as my reference for EFT payments? Always use your username as your reference. To find your username: First, You must log into your EaziBet account. Then click on "Account" then "User Data" and it will be displayed there. Your account ID is displayed above your Username in the Account Information section. We have 3 options: Bank Transfer, FNB Instant Cash eWallet Services or the ABSA 24hr Cash Withdrawal option. To make a withdrawal, start by logging into your EaziBet account. Select your preferred withdrawal method. For the FNB and ABSA methods, you do not have to bank with either to use this service, just make sure you are registered and been FICA approved with a valid RSA ID number. 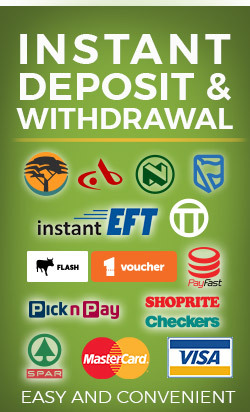 Only the FNB Instant Cash Withdrawal method is available outside of working hours. Bank transfers and the ABSA Cash send happen Monday to Friday during working hours and exclude public holidays. If you deposited with a Credit/Cheque Card then we will require a copy of the credit card to confirm that the card is in your name before we can process any withdrawals to that same card. We may need your FICA documents or you've reached the daily/monthly limit for the ABSA and FNB withdrawal methods. Please note that you are required by law to turn over your deposit at least once before you can make a withdrawal, especially when depositing with a voucher or ATM Cash Deposit. If you are using a new or different credit card for deposits, and we don’t have a copy of it, the withdrawal won't occur. Please contact info@eazibet.co.za. Are there any fees for withdrawing? If requesting a withdrawal to your credit card, Eazibet will charge a 5% administration fee. When using the FNB and ABSA withdrawal options, a charge is levied by either bank to use their services. Withdrawals can take up to three business days to reflect in your account. These are standard banking times. Should funds not reach your account with the 3 business days, please send an email to info@eazibet.co.za with all the information relating to the withdrawal request. If it’s a payment to any of the four banks that we also bank with, i.e. ABSA, Standard Bank, FNB and Nedbank, it could take no longer than 1 day from the time we pay you out. The FNB option should be within minutes of requesting it and the ABSA option should be within 24hrs if requesting on Monday-Friday during working hours. The choice is yours. Select which method suits you best from our withdrawal page once you are logged in. We normally pay you the same way you deposited. If you deposit via EFT we will simply transfer the money to your bank account. If you deposited with credit card then we pay you back to your card. You will have to make a request to change your method of payment by sending an email to info@eazibet.co.za. What’s the most I can withdraw? FNB is limited to R5000 a month and the ABSA option is limited to R1000 a day. If you haven’t been FICA verified yet you will not be able to withdraw funds. Please send your FICA documents to us via WhatsApp 0781751327. We have numerous promotions, come have a look at our Promo page. We also have random promo's and bonuses running on our social media platforms from time to time. Make sure you have liked our Facebook & Twitter pages so you don't miss out! Ordinarily, we contact you (via email, sms or phone) with different promotions offering you a specific bonus. In order to receive the bonus however, you normally need to claim it as it will not be credited automatically. This means that, after you’ve made a deposit you need to email info@eazibet.co.za to let us know that you want to receive the bonus which was offered to you. Why don’t I receive bonuses automatically? We don’t want to force any of our clients to take bonuses if they don’t want to as there are limitations in terms of turnover and abilities to withdraw. The issue comes in when clients don’t read the T&Cs and then are cross with us because we “assumed” they wanted the bonus. We feel that it’s your option and not our decision. What is a “Match Bonus”? A match bonus is a bonus that matches your deposit. For example, if we offer you 150% Match Bonus on your next deposit, then we will match your deposit by multiplying the amount you deposited by 1.50 (150%). So if you deposit R200, we will match it by giving you another R300, which means you will have R500 to place your bets with. Any bonus amount you receive from us must be turned over 5 times, and often at a “minimum price” (see explanation below) before you can withdraw anything. For example, if we give you R100 bonus and say that you must turn it over 5 times, it means that you must place bets at the total value of R500 before the turnover minimum has been reached. Price is another word for odds. With bonuses, sometimes we require that you place the bonus at a minimum price of 5/10 before you can withdraw. That means that if you place that money at odds less than 5/10, it won’t count towards your “turnover minimum”. Odds are a price set on the probability of the outcome of a sporting event. In a Win-Draw-Win market for example, whichever team or sportsman, has the highest odds is the most likely to lose. What’s the difference between fractional and decimal odds? The only difference is in the setting of your account. Whether the price is set on fractional or decimal, it’s still the same price, and you stand to win or lose the exact same amount. How do I work out the odds for a bet? The easiest way to calculate the odds to see how much you could win -or just to see who is more likely to win- is to get it down to a decimal. For example, 5/10 odds is the same as 0.5. You simply divide 5 by 10 and the result is 0.5. We are now using the European decimal and that includes your stake. All that means is if you see 0.5 for Liverpool to win on another bet site and 1.50 to win on EaziBet, you will still win the same amount. To calculate how much you could win you just multiply the decimal odds by your stake. If you are going to bet R50 on Liverpool winning their next match and the odds are 1.50, you multiply 1.50 x 50 = 75. So you could win R25 profit on that bet and you always get your stake back on a winning bet, so the total 'winning' amount is R75.00. Do the odds differ if betting is taken place before vs during the game? Why do odds differ on different sites? Because different bookmakers have different opinions on event outcomes. Log into your EaziBet account. Go to the event you want to bet on. Select a market (if there’s more than 1 for that specific event) and click on the odds. If you’re happy with your selection then submit your betting slip. Do you offer telephone betting? What is an In Play Bet? This is a bet that can be placed once a match has started and is currently being played. The prices will change according to the way the game is going. I’m trying to take a bet In-play but the market says suspended? The market may become suspended temporarily when the match reaches moments of increased volatility For example: In soccer when a team has been awarded a penalty in the box the market will be suspended pending a goal or no goal. In cricket when the umpire goes upstairs to the 3rd umpire and we are awaiting a decision betting will be suspended until a decision is made. You can combine a number of selections from different markets into one bet. eg. Manchester United to be the first team to score in their first game of the EPL season Arsenal to draw their first game in the EPL + Correct Score for Chelsea FC to finish their first EPL game with the score 2:1. If all these bets turn out to be correct then you win the multiple. If even 1 bet is incorrect you lose the entire bet. What are singles, doubles and trebles? Single Bet is one bet on a specific event outcome. eg. If you bet on Manchester United to win the EPL and they win you win the bet. Double Bet is two selections in different events where both must win. eg. If you bet on Chelsea FC and Arsenal FC to both win their first EPL season match and they both win you win the double bet. Treble Bet is the same as a double bet, where all three events must win for you to win the treble bet. eg. If you bet on Manchester United, Chelsea FC and Arsenal FC to all win their first EPL season match and they all draw or lose you lose the entire treble bet. What’s an enhanced multiple bet? It’s when you place several similar bets, for example if you choose several teams to make it to the semi-final or final of a tournament. It’s just like placing a regular bet. Add all your desired selections to the betslip and then enter your stake amount, then click "Continue". How and when do bets get settled? Bets normally get settled automatically right after a match has come to an end. In rare occasions when there are issues with the system, the traders will settle the bets manually. Can I place live bets on any sport or event? Almost. The only exception is horse racing. Can I cancel a bet once the match is live? Can the support service place bets for me? A stake is the monetary value of your bet. If you for example bet R50 on the outcome of a match then your stake is R50. What is a Betting Slip? How do I add more bets to my betting slip? Once you place a bet it automatically gets added to your betting slip. Once you’ve submitted a betting slip though you can’t add any more bets to it. How will my bet be settled if there is a dead heat? In the result of a dead heat your stake is halved and then multiplied by the odds to get your new price. Dead heats are predominantly found in horse racing betting and golf place betting. For full dead heat rules, please refer to our terms and conditions and sports betting rules. What happens if I want to dispute a settled bet? 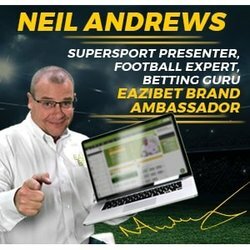 Please contact info@eazibet.co.za if you feel that a bet has been settled incorrectly. If support cannot resolve your query, then the dispute will be handed over to the relevant independent third-party bodies. In the dispute process, what role does the WCGRB play? If there is no resolution to a dispute between Playa and the customer, the Western Cape Gambling and Racing Board (WCGRB) will act as an impartial adjudicator. The WCGRB apply their knowledge to the facts and adjudicate by reference to the operator's own terms and conditions but do not rule on complex legal issues. WCGRB rulings are binding on all parties, without prejudice to any legal proceedings that may be commenced subsequently. Markets are different outcomes of events/matches/ tournaments that you can place bets on. For example, Win-Draw- Win is a market on which you have to choose an outcome. Either the home team wins - there’s a draw - or the visiting team wins. Is it any different betting on lucky numbers or horse racing than other sports? Yes and no. With any betting you bet on the outcome of a specific event. With lucky numbers you must choose a combination of numbers that will be drawn, and with horse racing you can bet on which horse will come first, second, or third etc. With other sports however there are many more possible outcomes such as who will score first, who will have the most goals by the first half time, or how many many yellow cards will be given during that match. What happens to my bets if the game is postponed? Please refer to the specific sports betting rules for postponements and abandonment rules for the affected sport. All match markets are based on the result at the end of a scheduled regulation time; e.g. in soccer it’s generally 90 minutes - unless otherwise stated. A bet on who will win the match. A bet where you have two chances to win. By taking a double chance on a team, you win the same amount of money if your team win or if they draw, meaning that only the defeat of the team you backed will result in a loss. A bet where the stakes would be refunded if there should be a draw. A spread on what combined score of both teams will be. This market will be settled on the final scores. One of two teams is generally given a “head start” in terms of the number of goals/points. Odds are then offered based on the “head start”. eg. If you bet on the Sharks plus 9.5 points and they win the match outright, you will still win your bet. Bookings refers to yellow cards and only yellow cards. If a player receives a red card, that will not be added to the total bookings of that match. A bet on who will win the tournament. Exotic markets are all markets except for Match Betting. Pre-Match Exotics are when you place bets on exotic markets before the match. What’s FICA? Why do I have to send in my private details? FICA is short for the Financial Intelligence Centre Act, a preventative measure taken by the government to fight crime, money laundering and terror financing. We are required by the WCGRB to collect FICA documents (Copy of ID, Proof of Residence) from each client in order to verify your identity and prevent any nefarious activity. How does EaziBet.co.za store my FICA information? Is it safe? We store your information off-site and safely, in a location which very few people have access to. It’s kept very safe and it's for your EaziBet account safety and also for WCGRB’s purposes. How do I FICA my account? Email your FICA documents (copy of ID, proof of address) to: info@eazibet.co.za. What may I use as a proof of residence? Where the person lives in any type of residence (eg. hostel/barracks) a letter from the administration department of such residence on an official letterhead.